The sheer number of attacks on websites and blogs around the world is massive, and things are only going to get worse. It’s probably safe to assume that if your website or blog hasn’t been hacked yet, then it’s inevitable that at some point in time someone will attempt to hack into your site. 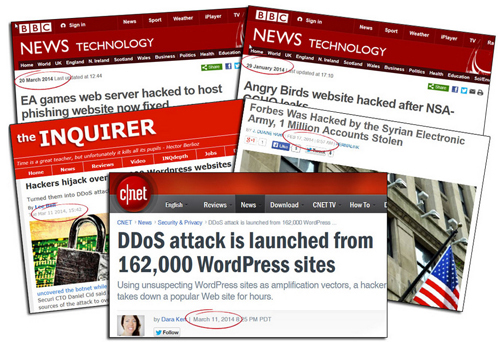 On March 11, 2014, technology sites like Cnet.com began reporting that over 162,000 legitimate WordPress websites had been hacked. Thousands of websites and blogs are attacked every year! Will yours be one of them? According to security firm Sucuri, hackers had leveraged a flaw to attack unsuspecting WP sites and direct a distributed-denial-of-service cyber attack (DDoS) towards another popular website. You may think that the information in your website or blog offers little to no value to hackers, but the reality is that every website has value to a malicious user. If a malicious user can find a software vulnerability in your security, the website or blog can then be employed to attack larger and more highly-valued sites. The truth is that software-driven bots are trying to hack into your website right now. Whether they can hack into your site will depend on how difficult or easy you have made it for hackers to keep trying until they can either discover how to get in, or are forced to give up and go look for a less protected target. You will see that the scan will display a number of results and details about your site setup. It should be obvious after using the tool shown above that if you can access all of this information about your website, so can hackers. 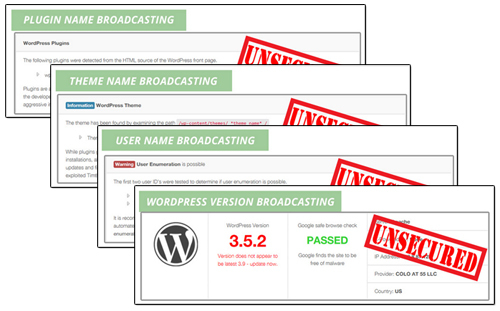 Being able to see what version of WordPress you are using, which plugins and themes you have installed, and which files have been uploaded to certain directories in your site can all be valuable information to hackers, as these can inform them about potential security vulnerabilities, especially in older versions. Fortunately, there is a solution that will stop broadcasting all of this information about your site and make your site invisible to hackers and botnets. 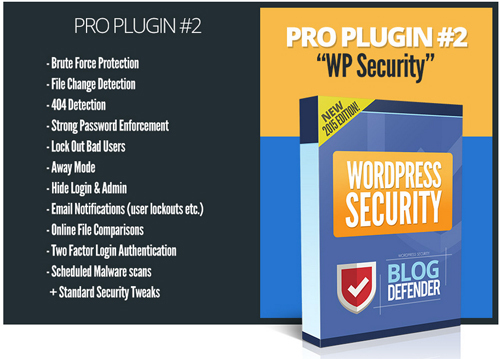 Blog Defender is a package of WordPress security video tutorials, WordPress plugins and tools, plus WordPress security documentation in PDF and DOC formats. 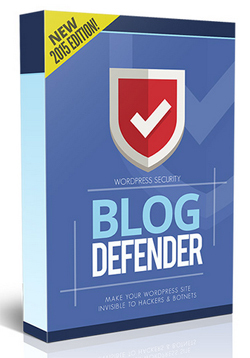 Matt Garrett, the developer of the BlogDefender security suit developed BlogDefender after noticing that a WordPress blog he set up for his mother had been hacked into and suspended. This particular site was not being used and had practically nothing of value to offer, yet it was still targeted by hackers. Matt only became aware of this after being informed by his host and noticing that a significant amount of suspicious activity had occurred within his site, as well as the addition of a number of phishing files by whoever had broken into the site. Matt’s experience should be enough to illustrate the fact that every website has value to hackers. The “Automated Backups” plugin lets you do automated backups to your server, external servers and well-known cloud-based backup solutions using different backup methods (e.g. FTP), perform full or partial backups, exclude files or tables from backups, restore backups, replace URLs (useful when migrating websites to different domains or server locations), search and replace text in your WordPress database, perform malware scans and blacklist checks automatically, and more. This plugin provides a range of essential file and site protection functions (see “Blog Defender Features” section below). 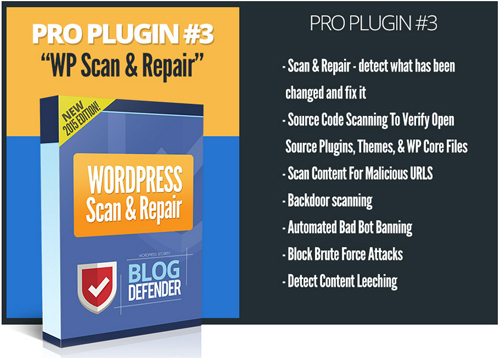 Pro Plugin #3 “WP Scan & Repair” also scans content to see if any malicious scripts have been added to your site, bans bad bots, blocks brute force attacks and detects any content leeching (where others benefit from your content without reciprocating the favor). The plugins are very easy to install. Simply upload a zip file containing the plugins to your Plugin folder via your dashboard and activate. 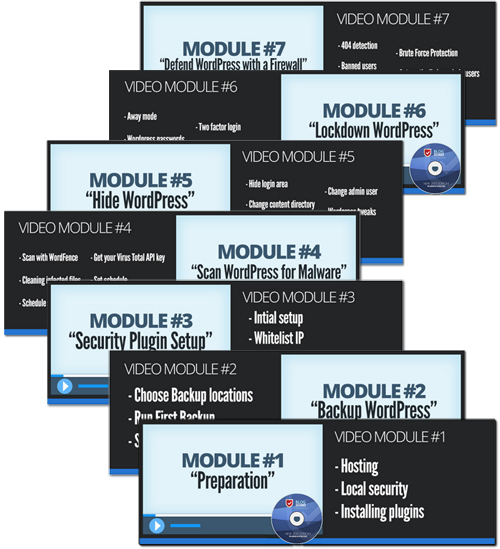 Blog Defender is an easy-to-follow do-it-yourself training product that walks you through the website security process and shows you what to do, including how to set everything up, and even which plugins you can install for free to get the job done inexpensively. Protect your WordPress site from hackers, spammers, bad bots, data miners and malicious users whose aims is to exploit your site for their own personal and financial gain. 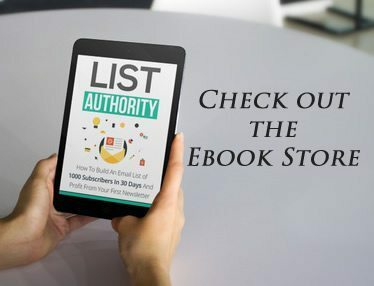 Protect Your Info Products From Being Freely Distributed – If you’re a digital product author (e.g. 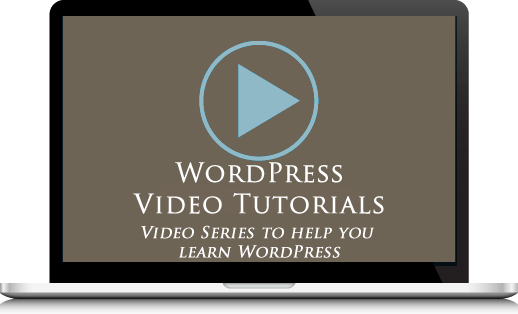 downloadable ebooks, video training, etc. ), your product can end up as freeware on peer-to-peer sharing sites. Avoid Getting Blacklisted By Your Host – When a site gets hacked, expect to go through a great deal of inconvenience and aggravation. It can take days to uncover the problem and sort through the issues these have caused. As a result, your, account can get suspended by your host, or even blacklisted by search engines. In addition, hackers can spam your contact list and steal your personal details and financial information, you could end up being fined or even charged with fraud, and much more. 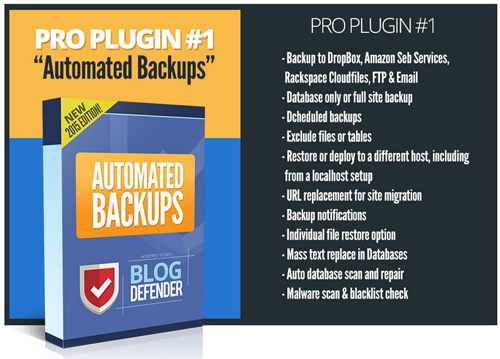 Blog Defender was created to keeps your site and your business safe and secure 24/7. 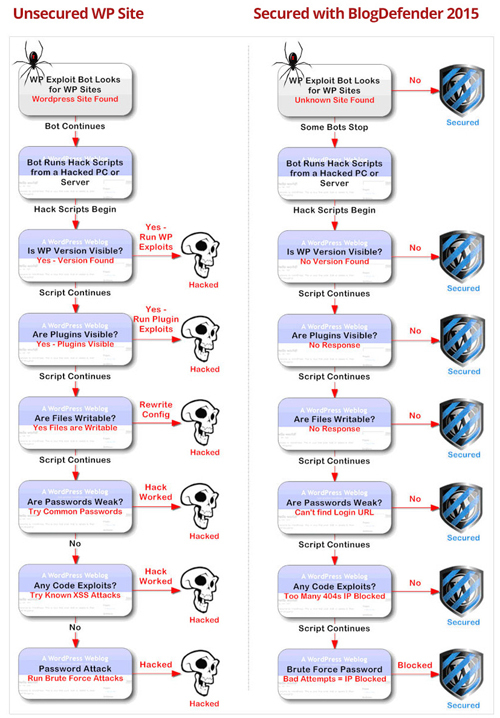 Blog Defender provides a logical sequence of steps to help secure your site, addressing hosting security, using scanning and detection tools to identify risky WP themes and WP plugins, and then implementing site-wide security using the tools and plugins provided. According to the plugin developer, Matt Garrett, since Blog Defender was first released in 2012, no Blog Defender-protected websites or blogs were hacked. The war on hackers is an ever-escalating arms race and all security solutions are only as good as the information and tools that developers can currently get their hands on. 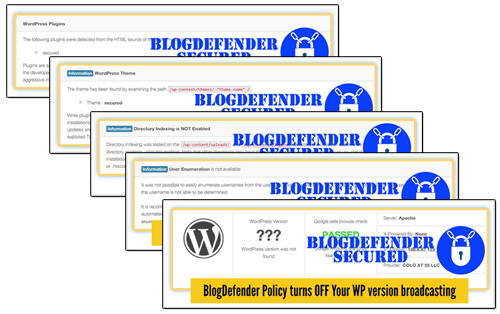 The latest release of Blog Defender creates an easier security solution that doesn’t need constant attention, doesn’t cost a fortune and it’s as good if not better than most premium security products or services currently being offered at a higher price. 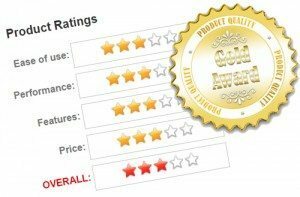 The product is well-supported, can be used by both Mac and PC users, is compatible with the latest WordPress release and is backed by a no-risk, thirty day, 100% refund guarantee. 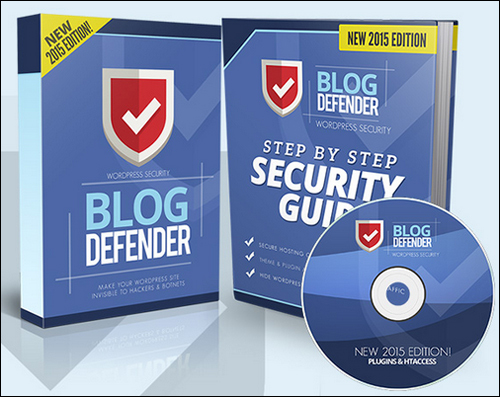 Blog Defender is normally available with a personal license only for use on unlimited sites. When we last checked, however, it was also being sold with Developer rights, allowing users to secure client sites as well.. Cost = $47.00. Please Note: The cost to purchase Blog Defender depends on whether there are any promotions or limited-time special offers. Presently, the product is being retailed for the pricing shown above. This may or may not be the actual price set by the product developer when you visit the site and you may be shown additional upsells or one-time offers after your purchase. No matter what type of business you run or plan to run online and how small you think your web presence is, securing your website is something you simply cannot ignore. 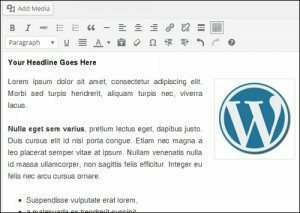 WordPress is a very secure web platform, but neglecting essential maintenance tasks like ensuring that your WordPress software, plugins and WP themes are kept updated to their latest versions, tightening file and data security and taking other necessary precautions can have disastrous consequences. Adopting security procedures like the one that Blog Defender provides, will help you understand what your security responsibilities as a website owner are, what hosting companies can and can’t do if your websites are hacked, what security features to look for in a webhost, and how to avoid major security risks without costly solutions.